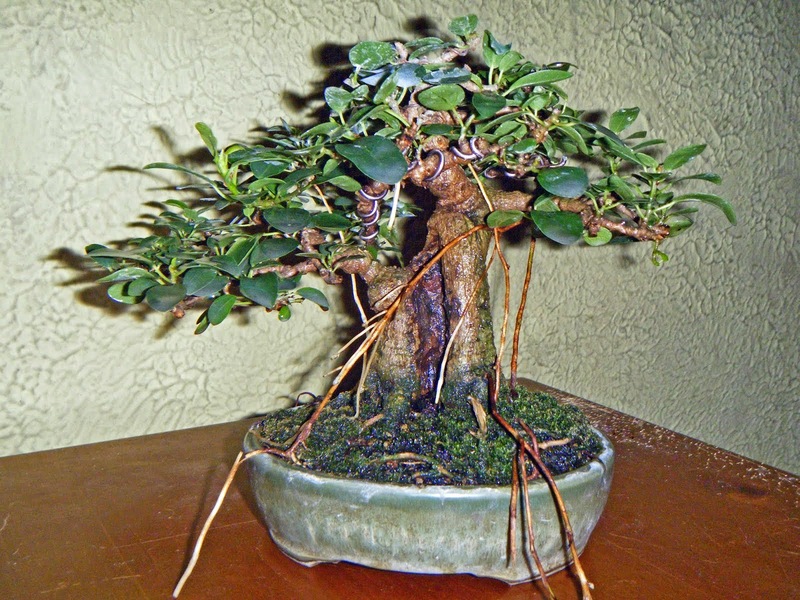 Spring is a good time for bonsai workshops. To borrow an expression from my friend Dave Burke, a workshop "gets the bonsai juices flowing" after the winter. What better way? This year the guest teacher for our Spring B.Y.O.T. workshop was Scott Yelich, current president of the Indianapolis Bonsai Club and owner of Eagle Creek Bonsai in that city. (B.Y.O.T. stands for "Bring Your Own Tree," for any who don't know.) Scott specializes in tropical species, but he's experienced and knowledgeable when it comes to temperate-zone trees as well. Which is a good thing, because as best I recall, none of the trees brought in for his attention on April 22nd were tropicals! Jerry and Darlene Kittle hosted us once again, and a carry-in lunch made sure no one was distracted by a discontented stomach. Before the workshop itself started, there was a soil-mixing session; the club maintains a supply of bonsai soil which is available to members at low cost. Jerry Kittle loads another bag into the cement mixer. Susan and her daughter Sophie bag the finished mix. - and Elias ponders what Scott has to say. Al McMillan brought a nursery-purchased Boulevard cypress (Chamaecyparis pisifera 'Boulevard') that had obviously had its leader chopped 8-10 inches above the soil when it was younger. Several shoots had broken just below the chop, resulting in an almost artificial-looking tree (to my eye) with four rather spindly-looking trunks. I think Scott's solution is best described as elegant. He removed two of the trunks, leaving jin and shari behind, and transformed Al's tree into a very natural-looking twin-trunk bunjin. I look forward to seeing it on display once Al gets it moved into a bonsai pot! Right to left: Al, Scott, Shay (sp?) and Deanna (partially hidden). Scott does some detail work near the apex of the "daughter" trunk. I found myself in a dilemma as the workshop approached. The best candidate for a B.Y.O.T. workshop, in my judgment, is a tree which is ready for some serious styling work but which has me stumped (word-play intended) as to what to do with it. And I had no tree available that fit that description! Every tree I had either was not yet ready for styling or was one for which I already had a definite design in mind. Multi-trunk common privet I bought from Scott, before work was begun. This tree was collected, Scott told me, from a private nature preserve near Bloomington, Indiana. Privet is an introduced species here in the US, so the preserve owners gave Scott and his companions permission to remove as many as they liked! Scott moved this clump specimen into a 12-inch plastic pot, mulched it heavily, and kept it long enough to be sure it was healthy before offering it for sale. Ligustrum roots readily, and when I started probing to find the natural nebari, I discovered almost 2 inches of fibrous roots, all through the mulch, above what were presumably once the surface roots! I used a hose to clean the root system enough to find the nebari. At this point I still hadn't found it. Picking a front was the next step, and Scott gave me a good suggestion on that point, which I accepted. The original main trunk is dead down to the orange line in the next picture. I plan to hollow that portion out, if the wood isn't too weakened to stand up to the Dremel. The blue arrow indicates the new primary trunk, and there will be four auxiliary trunks, for a total of five living trunks. Pruned, wired and repotted in my own mix after I got home. This is the provisional front. 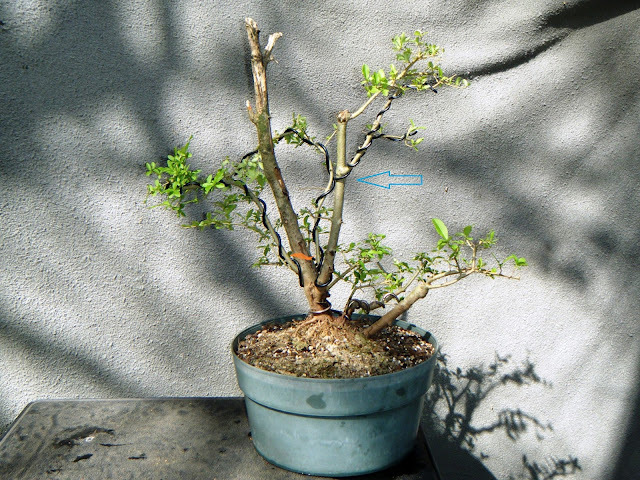 Some of my readers may have seen a multi-trunk privet bonsai that was owned for many years by the late Jack Fried (pronounced Freed) of Highland Park, Illinois. Jack would enter the tree in the Mid-America Bonsai Exhibit every 2-3 years, and it just kept getting better and better! 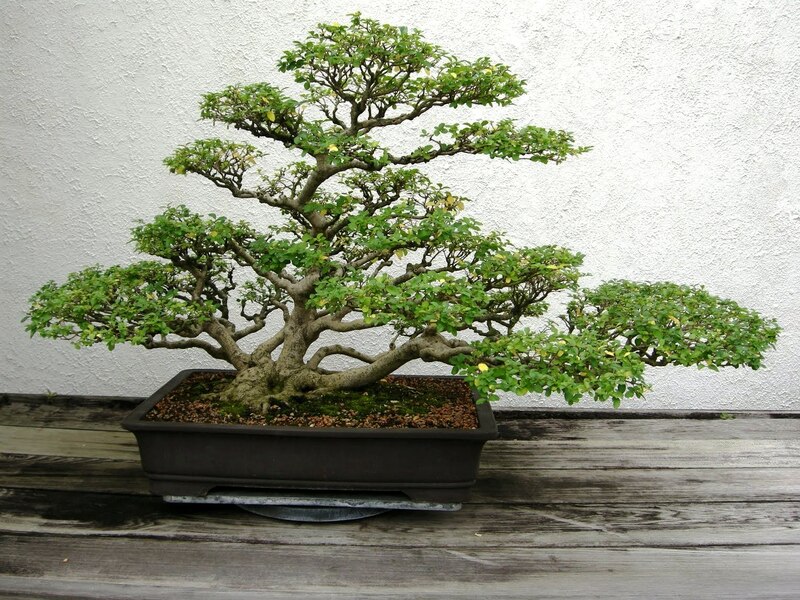 In 2010, that bonsai was accepted into the National Bonsai and Penjing Collection in Washington, D.C., where it may be seen today. To my frustration, I could find none of my own pictures of Jack Fried's privet. The picture below was posted on Pinterest by someone with the username "Constant Gardener." I could find no copyright information, but hereby acknowledge the source of this image. Jack Fried's Ligustrum vulgare bonsai, now in the National Collection. I don't know if my privet bonsai will ever be as magnificent as Jack's. But Jack's tree sure gives me something to strive for!